Corrosion is the deterioration of materials by chemical interaction with their environment. Most metals corrode on contact with water (and moisture in the air), acids, bases, salts, oils, aggressive metal polishes, and other solid and liquid chemicals.Metals will also corrode when exposed to gaseous materials like acid vapors, formaldehyde gas, ammonia gas, and sulfur containing gases. The term corrosion is sometimes also applied to the degradation of plastics, concrete and wood, but generally refers to metals. 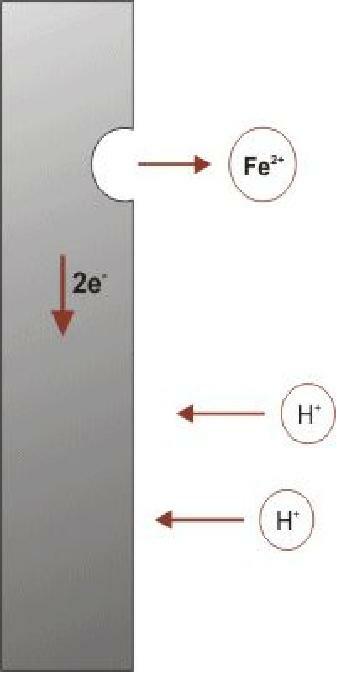 The corrosion process (anodic reaction) of the metal dissolving as ions generates some electrons, as shown here, that are consumed by a secondary process (cathodic reaction). These two processes have to balance their charges. The sites hosting these two processes can be located close to each other on the metal’s surface, or far apart depending on the circumstances. The electrons (e- in this figure) produced by the corrosion reaction will need to be consumed by a cathodic reaction in close proximity to the corrosion reaction itself. The types of corrosion is divided into three major groups. Group 1 are those that are readily identifiable by ordinary visual examination. Group 2 are specific conditions that may require supplementary means of examination. Finally, Group 3 undergoes verification and is usually required by microscopy (optical, electron microscopy etc.) This also highlights the Atmospheric Corrosion and High Temperature Corrosion. 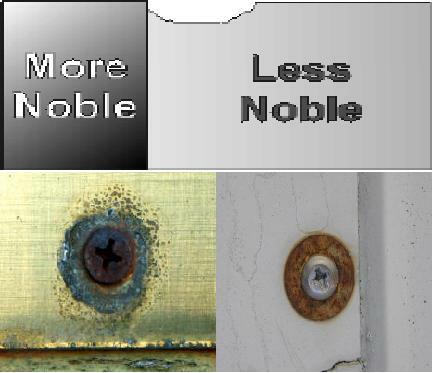 Group 1 are types of corrosion readily identifiable by ordinary visual examination. This includes Uniform corrosion, Pitting, Crevice corrosion (under which are: crevice model, filiform corrosion, and pack rust), Galvanic corrosion, Lamellar corrosion. The Group 2 types may generally require supplementary means of examination. Erosion corrosion, Cavitation, Fretting corrosion, Intergranular corrosion, Exfoliation, and Dealloying (selective leaching or Selective Attack) are what specifies the depth of a certain corrosion in this category. Group 3 is where the corrosion undergoes verification and is usually required by microscopy (optical, electron microscopy etc.) 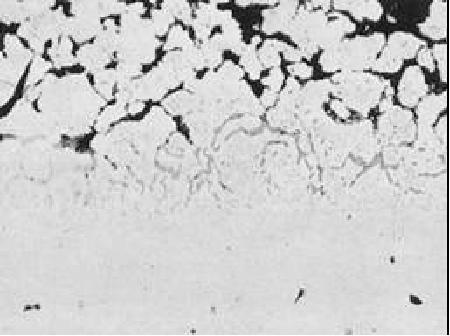 The specific types may fall under Environmental Cracking, Stress Corrosion Cracking (SCC), Corrosion fatigue, and Hydrogen embrittlement. 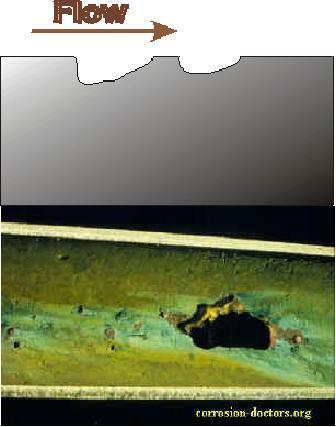 This type of corrosion occurs over the majority of the surface of a metal at a steady and often predictable rate. As the most common form of corrosion, this is normally characterized by a chemical or electrochemical reaction, which proceeds uniformly over the entire exposed surface or over a large area. Pitting Corrosion occurs in materials that have a protective film such as a corrosion product or when a coating breaks down. This is a localized form of corrosion by which cavities or “holes” are produced in the material. Crevice corrosion is a localized form of corrosion usually associated with a stagnant solution on the micro-environmental level. 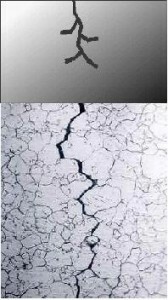 A special form of crevice corrosion in which the aggressive chemistry build-up occurs under a protective film that has been breached. 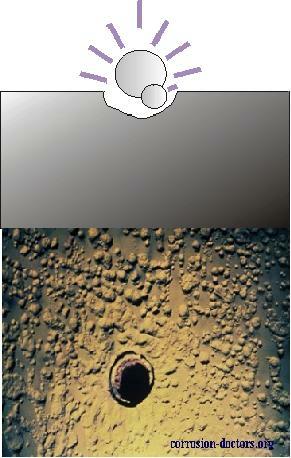 Normally starts at small, sometimes microscopic, defects in the coating. Lacquers and “quick-dry” paints are most susceptible to the problem. Their use should be avoided unless absence of an adverse effect has been proven by field experience. Where a coating is required, it should exhibit low water vapor transmission characteristics and excellent adhesion. Zinc-rich coatings should also be considered for coating carbon steel because of their cathodic protection quality. Pack rust is a form a localized corrosion typical of steel components that develop a crevice into an open atmospheric environment. This expression is often used in relation to bridge inspection to describe built-up members of steel bridges which are showing signs of rust packing between steel plates. This occurs when two different metals are placed in contact with each other and is caused by the greater willingness of one to give up electrons than the other. 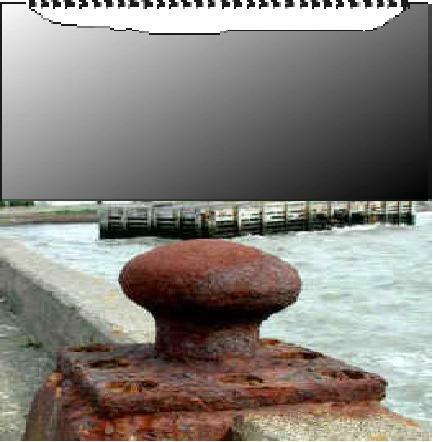 This is one of the most common forms of corrosion as well as one of the most destructive. Here’s a classic example of galvanic corrosion; a stainless screw in contact with a cadmium plated steel washer. The galvanic reaction between iron and copper was originally mitigated by insulating copper from the iron framework using an asbestos cloth soaked in shellac. However, the integrity and sealing property of this improvised insulator broke down over the many years of exposure to high levels of humidity normal in a marine environment. 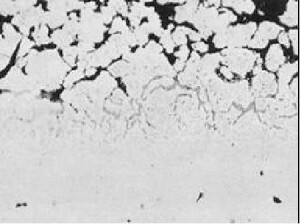 Exfoliation corrosion is a particular form of intergranular corrosion associated with high strength aluminum alloys. 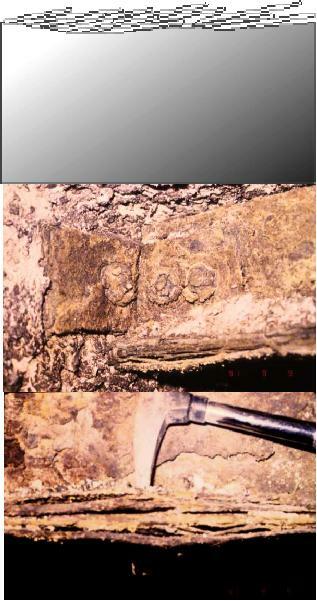 Alloys that have been extruded or otherwise worked heavily, with a microstructure of elongated, flattened grains, are particularly prone to this damage. In ferrous alloys, exfoliation is characterized by excessive internal growth of oxide, which has a volume some seven times that of the steel. Excessive internal growth of oxide can elevate temperature and the exfoliated material damage turbines. 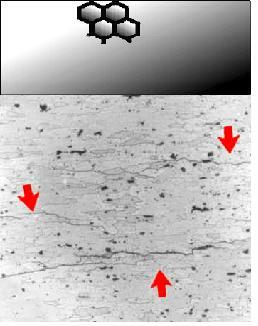 Exfoliation occurs in ferritic materials when multilayer growth occurs. Stresses are induced by temperature cycles and by the difference in thermal expansion between the scale and tube. Exfoliation can also occur in austenitic stainless steels, again because of the difference in thermal expansion between the metal and the oxide. Erosion corrosion is an acceleration in the rate of corrosion attack in metal due to the relative motion of a corrosive fluid and a metal surface. The increased turbulence caused by pitting on the internal surfaces of a tube can result in rapidly increasing erosion rates and eventually a leak. Erosion corrosion can also be aggravated by faulty workmanship. Cavitation occurs when a fluid’s operational pressure drops below it’s vapor pressure causing gas pockets and bubbles to form and collapse. This form of corrosion will eat out the volutes and impellers of centrifugal pumps with ultra pure water as the fluid will eat valve seats. It will contribute to other forms of erosion corrosion, such as found in elbows and tees. 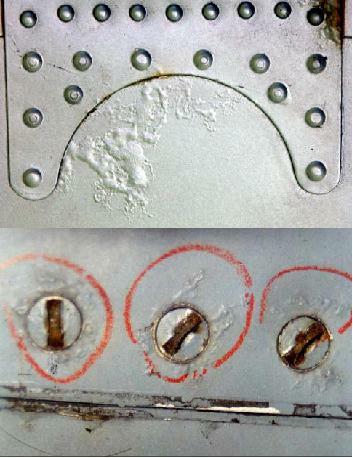 Fretting corrosion refers to corrosion damage at the asperities of contact surfaces. 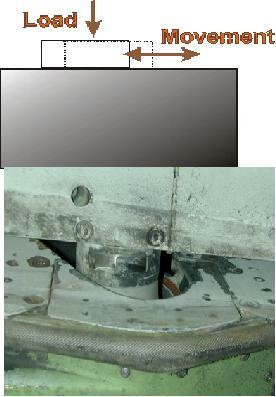 This damage is induced under load and in the presence of repeated relative surface motion, as induced for example by vibration. Pits or grooves and oxide debris characterize this damage, typically found in machinery, bolted assemblies and ball or roller bearings. 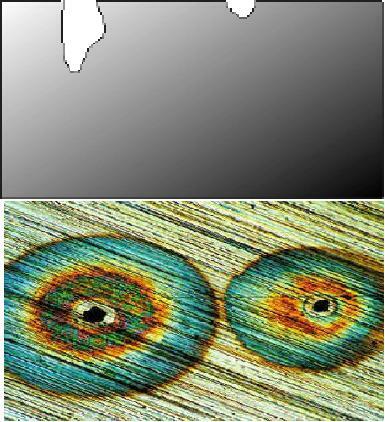 Intergranular corrosion is localized attack along the grain boundaries, or immediately adjacent to grain boundaries, while the bulk of the grains remain largely unaffected. Dealloying or selective leaching refers to the selective removal of one element from an alloy by corrosion processes. (SCC) is the cracking induced from the combined influence of tensile stress and a corrosive environment. Corrosion-fatigue is the result of the combined action of an alternating or cycling stresses and a corrosive environment. 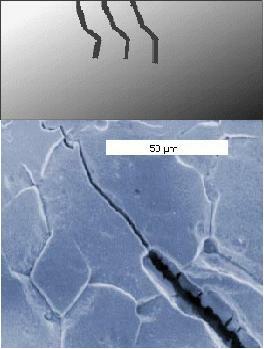 The fatigue process is thought to cause rupture of the protective passive film, upon which corrosion is accelerated. If the metal is simultaneously exposed to a corrosive environment, the failure can take place at even lower loads and after shorter time. 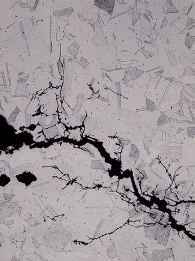 It involves the ingress of hydrogen into a component, an event that can seriously reduce the ductility and load-bearing capacity, cause cracking and catastrophic brittle failures at stresses below the yield stress of susceptible materials. Metals can corrode when exposed to the outdoor atmosphere as a consequence of wet and dry cycles induced by rainfall and condensation. Corrosion is more significant when pollutants such as sulphur dioxide or chloride are present in the atmosphere. This is a form of corrosion that does not require the presence of a liquid electrolyte. 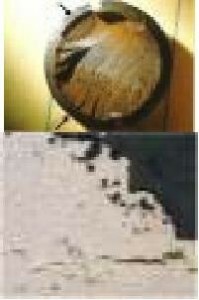 This type of damage is called “dry corrosion” or “scaling”. The oxidation of metal/Alloy has resulted from exposing to high temperature. 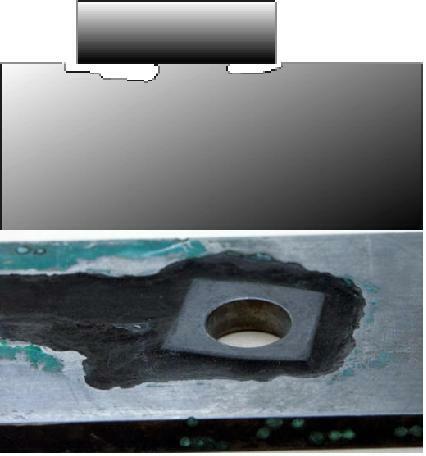 Reduction of metal thickness leading to loss of mechanical strength and structural failure or breakdown. When the metal is lost in localized zones so as to give a crack like structure, very considerable weakening may result from quite a small amount of metal loss. Perforation of vessels and pipes allowing escape of their contents and possible harm to the surroundings. For example a leaky domestic radiator can cause expensive damage to carpets and decorations, while corrosive seawater may enter the boilers of a power station if the condenser tubes perforate.